And we’re off! The campers are arriving from all over America and all across the world. We have campers from France, Spain, Nicaragua, and from England coming in today. As usual we had a few early birds show up before the one o’clock check in time. After that they came in a steady stream until almost all of our American campers had arrives. We have two large groups of French and Spanish campers coming in later tonight. For those here at camp we had activities running all afternoon, ranging from arts and crafts to ultimate Frisbee and the swim test. 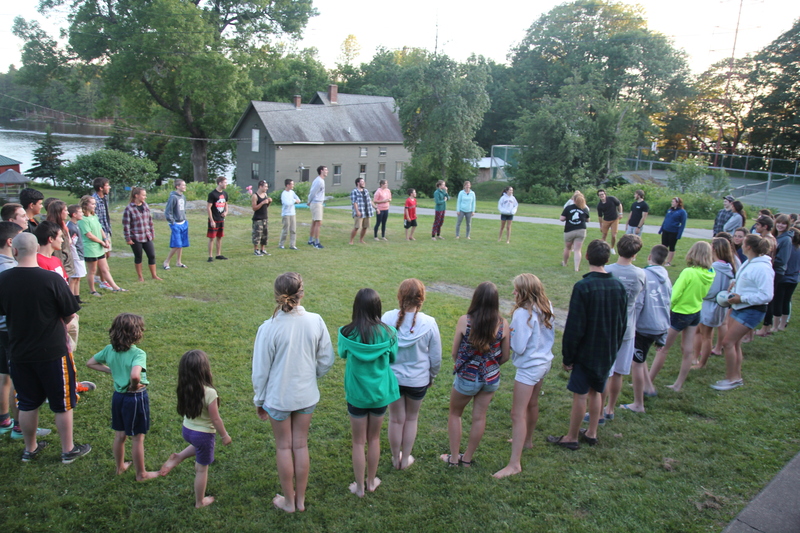 Before dinner, a bunch of campers got together on the steps of the lodge and were already talking like old friends. Tonight’s evening activity is get to know you games. Everybody is outside right now playing evolution, which is an advanced form of rock paper scissors where each time someone wins a round they evolve. First they evolve from an egg to a chicken, then to a velociraptor and a princess and finally a rock star. Before that they learned each other’s names with cheers and trains of people and played “switch if”. All of the campers and counselors are having a blast and meeting a bunch of people in the process. This seems like an amazing group of campers and the staff can’t wait to spend the next three weeks getting to know them all.